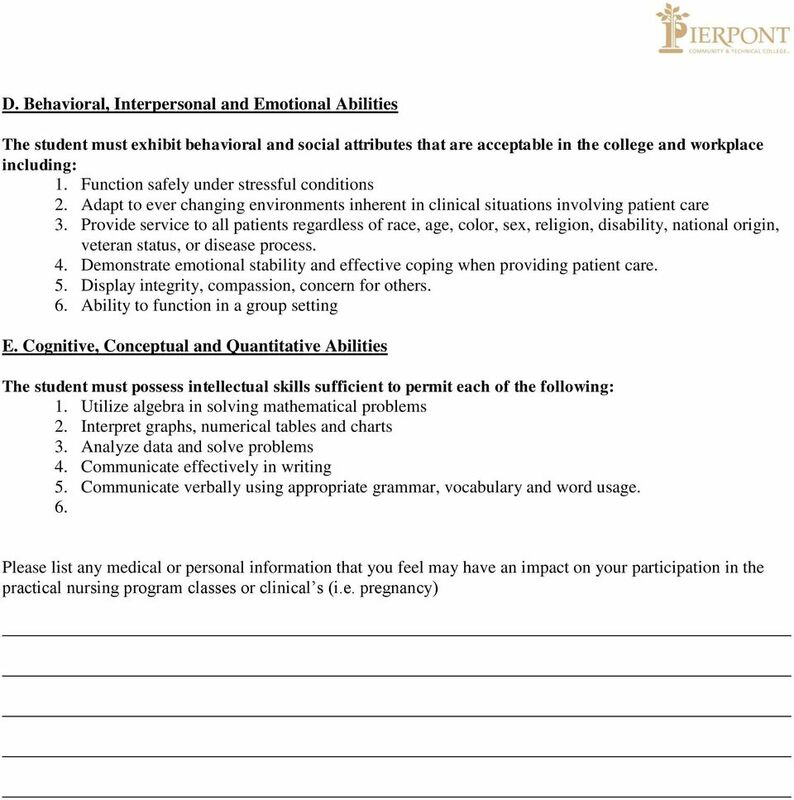 Download "Pierpont Community & Technical College School of Health Careers Practical Nursing Program"
2 positive titer for all 3 components, and Rubeola vaccination with proof of positive titer. Also recommended are a DPT booster, and influenza vaccine. If required proof of immunization is not submitted by August 1, you will be dropped from the program. 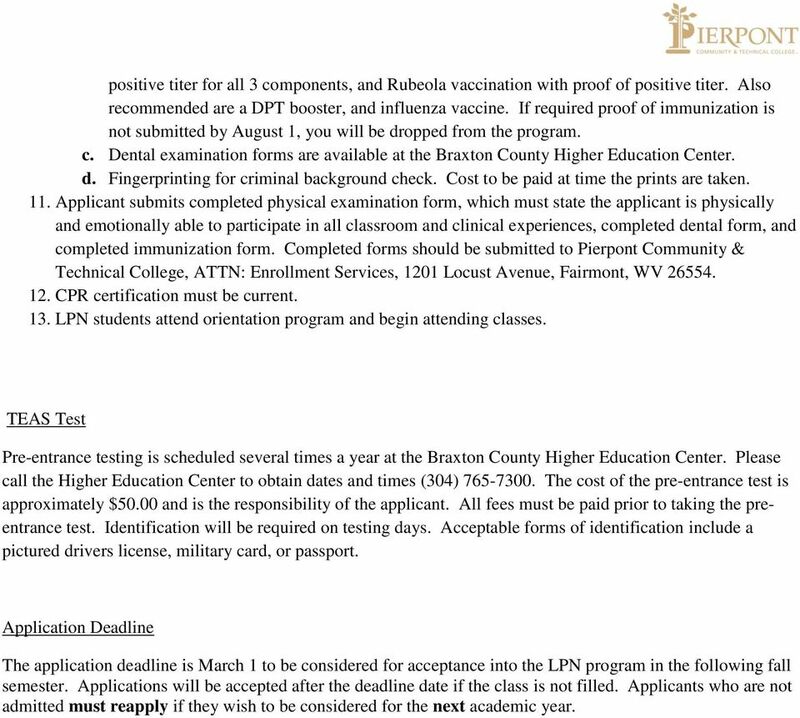 c. Dental examination forms are available at the Braxton County Higher Education Center. d. Fingerprinting for criminal background check. Cost to be paid at time the prints are taken. 11. Applicant submits completed physical examination form, which must state the applicant is physically and emotionally able to participate in all classroom and clinical experiences, completed dental form, and completed immunization form. Completed forms should be submitted to Pierpont Community & Technical College, ATTN: Enrollment Services, 1201 Locust Avenue, Fairmont, WV CPR certification must be current. 13. LPN students attend orientation program and begin attending classes. TEAS Test Pre-entrance testing is scheduled several times a year at the Braxton County Higher Education Center. Please call the Higher Education Center to obtain dates and times (304) The cost of the pre-entrance test is approximately $50.00 and is the responsibility of the applicant. All fees must be paid prior to taking the preentrance test. Identification will be required on testing days. Acceptable forms of identification include a pictured drivers license, military card, or passport. 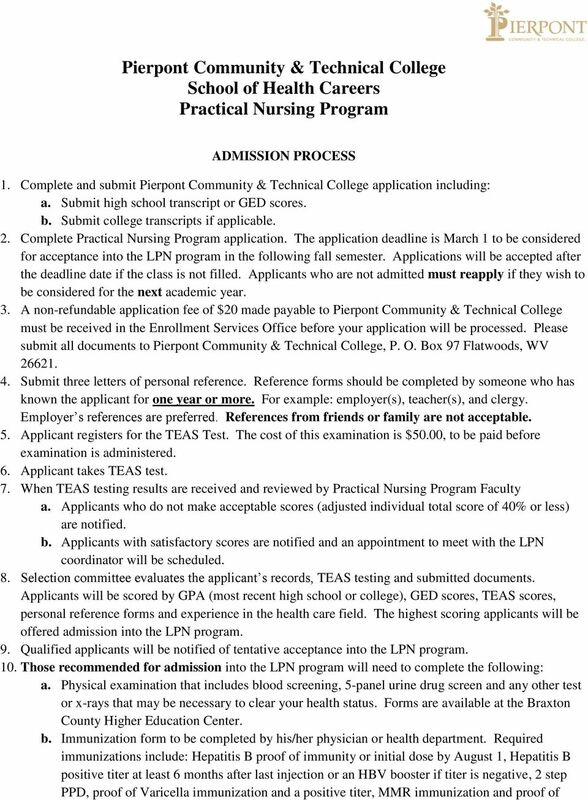 Application Deadline The application deadline is March 1 to be considered for acceptance into the LPN program in the following fall semester. Applications will be accepted after the deadline date if the class is not filled. Applicants who are not admitted must reapply if they wish to be considered for the next academic year. 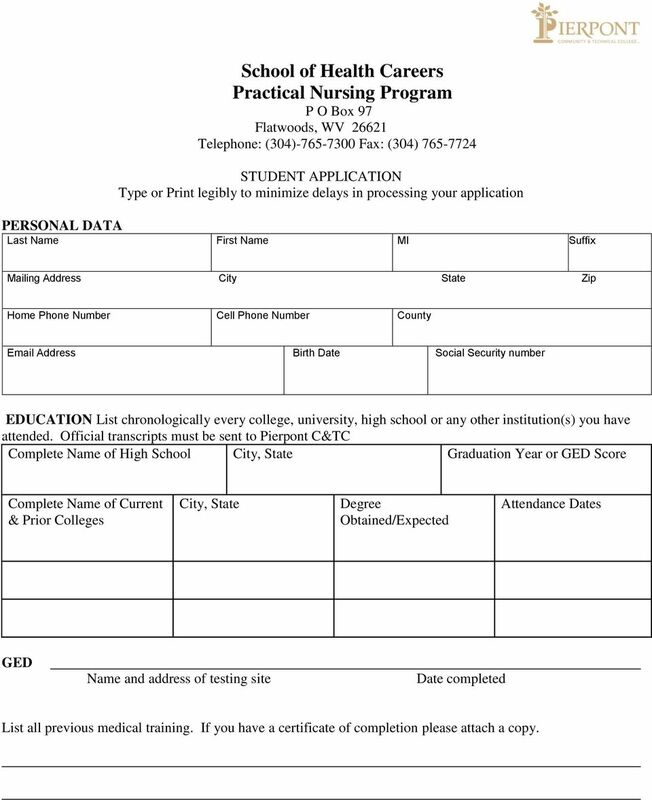 3 School of Health Careers Practical Nursing Program P O Box 97 Flatwoods, WV Telephone: (304) Fax: (304) STUDENT APPLICATION Type or Print legibly to minimize delays in processing your application PERSONAL DATA Last Name First Name MI Suffix Mailing Address City State Zip Home Phone Number Cell Phone Number County Address Birth Date Social Security number EDUCATION List chronologically every college, university, high school or any other institution(s) you have attended. Official transcripts must be sent to Pierpont C&TC Complete Name of High School City, State Graduation Year or GED Score Complete Name of Current & Prior Colleges City, State Degree Obtained/Expected Attendance Dates GED Name and address of testing site Date completed List all previous medical training. If you have a certificate of completion please attach a copy. 4 List work experience for the last 5 years (attach additional sheets if necessary) All applicants must answer questions #1-7 of the application by circling YES or NO. The applicant is to provide a letter of explanation regarding any convictions 1. Have you EVER committed an act of academic dishonesty resulting in disciplinary action by a school? YES NO 2. Have you EVER been convicted of a felony or a misdemeanor, pled guilty, or pled no contest to any crime, had records expunged or been pardoned? (List speeding tickets only if you have received three (3) speeding tickets in the last two (2) years). YES NO 3. Are you currently abusing prescription or over-the-counter medication? YES NO 4. Are you currently using illegal drugs? YES NO 5. Is there any reason why your access to narcotics or substances of abuse should be restricted or limited? YES NO 6. 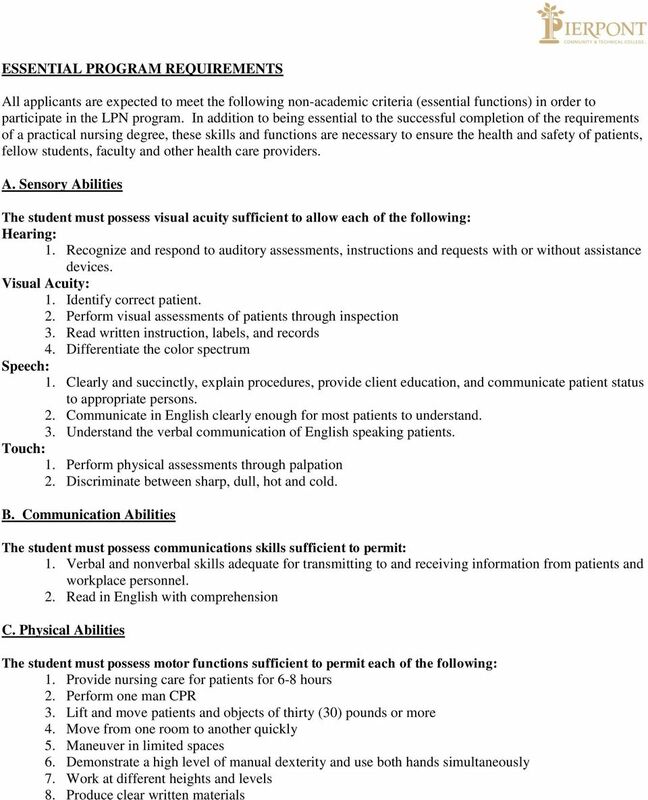 Do you currently possess any condition which may in any way impair your ability to practice or otherwise alter your behavior as it relates to the practice of licensed practical nursing? YES NO 7. Have you ever been or applied as a student in a Practical Nursing Program? YES NO If so, when and where?. 8. Have you ever been place on an abuse registry or otherwise had a license or certificate against which you have had any type of disciplinary action? 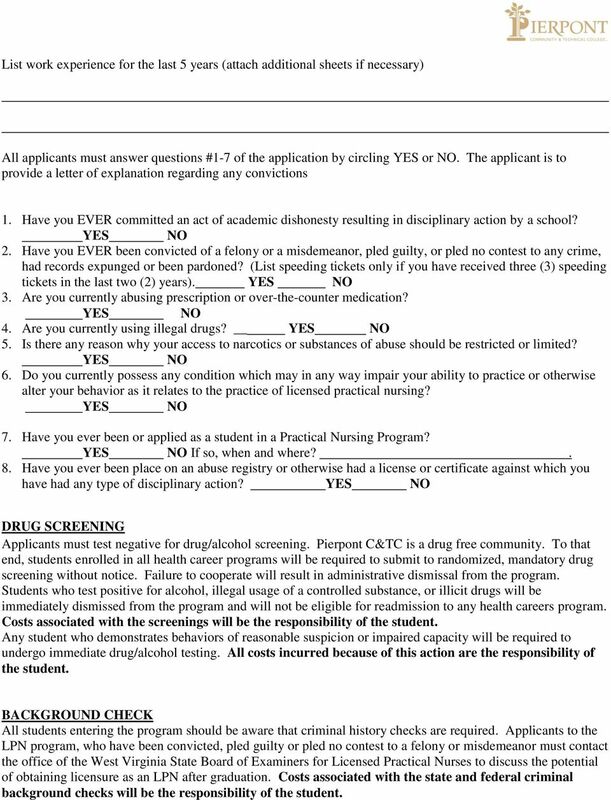 YES NO DRUG SCREENING Applicants must test negative for drug/alcohol screening. Pierpont C&TC is a drug free community. To that end, students enrolled in all health career programs will be required to submit to randomized, mandatory drug screening without notice. Failure to cooperate will result in administrative dismissal from the program. Students who test positive for alcohol, illegal usage of a controlled substance, or illicit drugs will be immediately dismissed from the program and will not be eligible for readmission to any health careers program. Costs associated with the screenings will be the responsibility of the student. Any student who demonstrates behaviors of reasonable suspicion or impaired capacity will be required to undergo immediate drug/alcohol testing. All costs incurred because of this action are the responsibility of the student. BACKGROUND CHECK All students entering the program should be aware that criminal history checks are required. 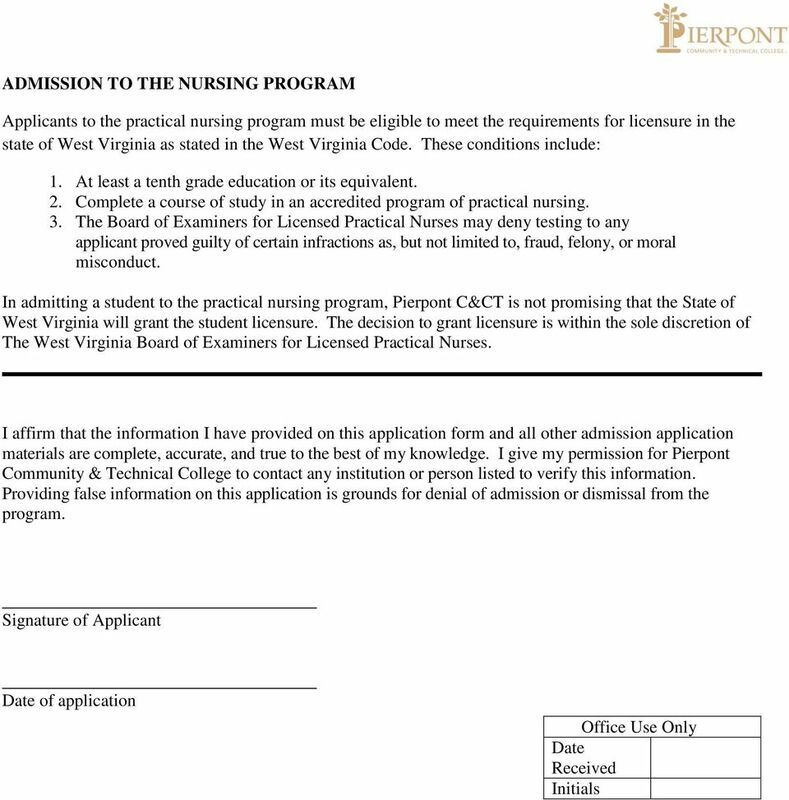 Applicants to the LPN program, who have been convicted, pled guilty or pled no contest to a felony or misdemeanor must contact the office of the West Virginia State Board of Examiners for Licensed Practical Nurses to discuss the potential of obtaining licensure as an LPN after graduation. Costs associated with the state and federal criminal background checks will be the responsibility of the student. Application Deadline for the Nursing Program is February 2, 2015. Turn in to Room 110-H between the hours of 8:30-4:30pm. Application Deadline for the Emergency Medical Professions Program is November 17, 2015. Turn in to Room 110-A between the hours of 8:30-4:30pm. Application Deadline for the Emergency Medical Professions Program is November 17, 2015. Turn in to Room 110-A between the hours of 8:30-4:30pm. Your BVCTC # will become your ID throughout this process. PLEASE REMOVE THIS PAGE BEFORE SUBMITTING APPLICATION.